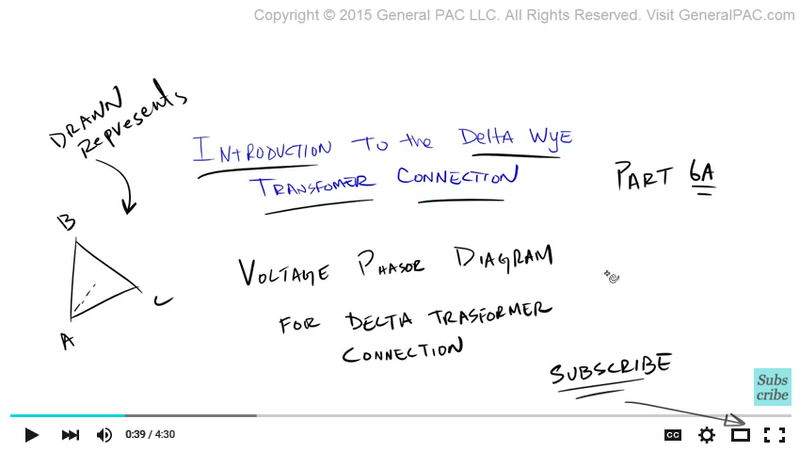 Introduction to the Delta Wye Transformer connection – Part 6A. 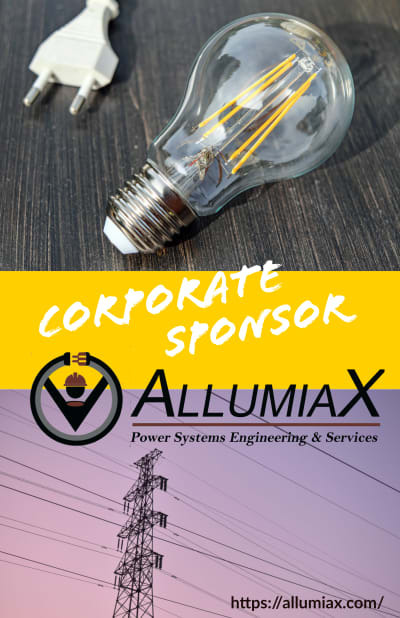 In this part, we'll talk about the voltage phasor diagram for the Delta transformer connection. So basically, we're going to understand how this particular transformer diagram - that's often found in name plates for example, we'll find out exactly how this is drawn and what this represents. If you haven't already, go ahead and click on the button on the bottom right corner of your screen and click on "subscribe" – you want to subscribe and get notified exactly when the next part of this video is going to come out. Let's scroll down and find out what we've done in the past. 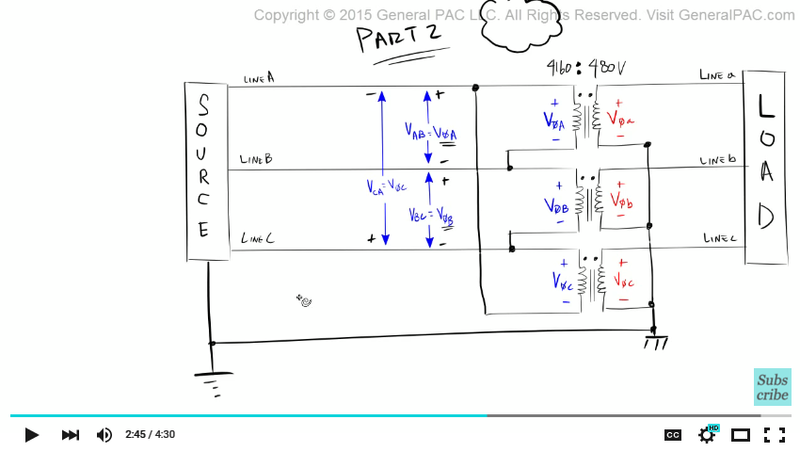 So in Part 2 of this video which you'll find a link right here – in part 2, we talked about the line-to-line voltage vs phase voltage relationship for both the Delta connection as well as the wye and star connection. Now make sure you review part 2 if you're having a hard time recalling. When we measure the line-to-line voltage between line A and line B, we'll see that that is essentially equal to phase A voltage. Similarly, when we measure the line-to-line voltage between line B and line C, that's going to equal phase B voltage. And lastly when we measure between line C and line A, that's going to equal phase C voltage. Again this was covered indeapthly in Part 2. 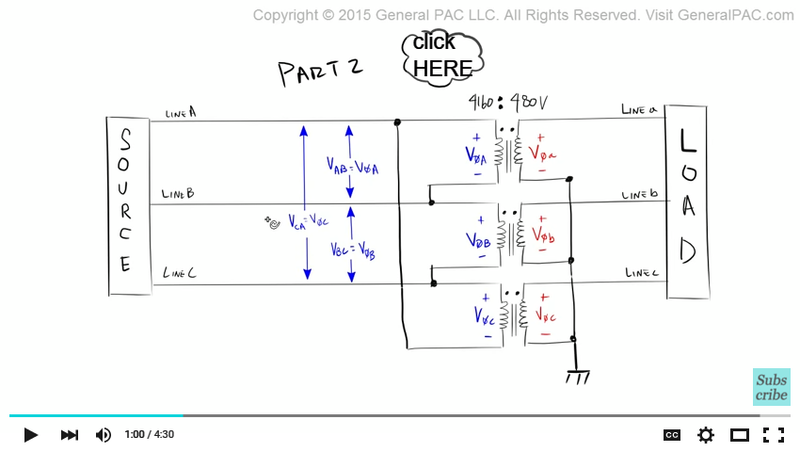 So in this video we're going to further talk about the voltage quantities on the delta side. Now to begin, let's clarify something. The delta has no ground – right. But there is a ground somewhere in our source. Some generator in our source is tied to ground. That ground is the reference for this transformer. Right? So we're going to assume it's this particular connection. So we know what the ground is. So we know that this ground is for the source. And we know that this ground is in reference to this particular delta connection. So now what I'm going to do is I'm going to connect/tie this ground to the wye side. And I'm going to say that it's all the same ground. Now that I have that established – I have the same reference quantity established. What I'm going to say is that the voltage across line A and this ground point here – If I measure the voltage across line A and this ground point here – I'm going to call this voltage V_AG. I've drawn the arrows here to indicate that. Now V_BG – that's going to be measure across line B and ground. So we're going to add arrows to illustrate that here. Okay so there is V_BG. And lastly, V_CG is the voltage across line C and ground. Now the trick to understanding Voltage phasors for the delta connection – is really rooted in the understanding of V_AG vs V_AB. So V_AB is the voltage across line A and line B – which is essentially equal to Phase A voltage. So we're talking about the difference of understanding phase A voltage vs V_AG voltage. And often times this V_AG quantity is also called V_AN – and is also referred to as this "reference" quantity. Okay – the "reference" quantity. And again – if you like this video and you want to see when Part 6B is going to come out, click on the button on the bottom right corner of the screen – and the click "subscribe". Once you've subscribed, you'll get an update in Part 6B as well as other tutorials.